Like a lot of people, I stayed up to watch the results come in on the EU Referendum. What is clear, in the immediate hours after the result, is that the country is split down the middle and already a lot of bitter accusations are being thrown around, no doubt driven by hurt, fear and uncertainty. In my May newsletter article, I pointed out that there was no single Christian view on this vote, but that there were Christians issues which would help inform us in our decisions. However, there is now a clear and urgent Christian concern for forgiveness, healing and reconciliation and our community and nation needs us as Christians to take the lead in that work. In the first few hours after the result, there were accusations of racism and xenophobia on one hand, and of lack of patriotism on the other. Neither of these positions stand up. It cannot be the case that half the population were motivated by xenophobia. By the same token, to accuse EU supporters of lacking patriotism entirely misses the point of the debate. As Christians, we are called to see beyond blame and name-calling and to relate to each individual as Christ does himself. The reality is that most voters found this decision difficult and voted honestly. You will remember that we were encouraged to work out what proportion of us was for remain and for leave. Most people were only marginally one way or the other, but had honest reasons for their assessment. 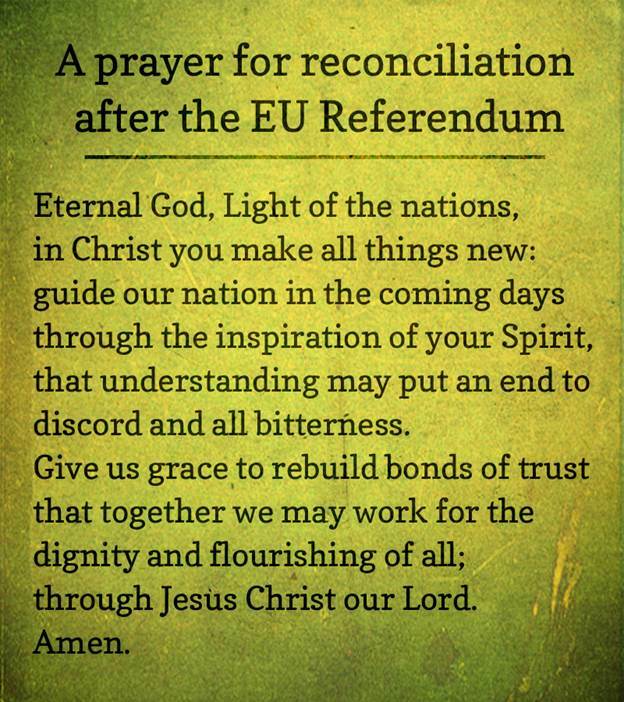 That is worth bearing in mind, however hurt we are about the result, as we face each other again in the post-referendum world. That is not to say that we must bury our passions and beliefs. Rather we must now channel them positively as we forge a new relationship with the world and with each other. I would hope that all Christians believe passionately in unity, fellowship and peace. But if we believe that, we must also remember that these qualities begin not with our political structures, but in the relationships between the individuals who make up our local communities and in turn create our national and international identity. Charity begins at home and charity, in its true sense, simply means love. Now, more than ever, we need to live by Christ’s commands to love one another, to forgive as we have been forgiven and to show mercy as we have received mercy from God. Every act of forgiveness between individuals, every step towards reconciliation will be of supreme value in the hours, days and weeks ahead. But politically too, we can play our part. The official Leave campaign was at pains to point out that they were not advocating isolationism, but rather a new relationship with Europe and the wider world. And in his post-referendum speech Boris Johnson pledged to work for a close relationship with Europe and an outward-looking generous approach to the world. It is our Christian duty to hold them to that. It appears that we will no longer be relating to the world as members of the EU, but we can all model and promote an attitude to the wider world of generosity, welcome and care. As our membership of the EU draws to an end, new treaties, alliances and relationships will form. As Christians we can continue to use our democratic right to ensure that these promote unity, fellowship and peace between nations, care for the poor and marginalised and the welfare of the whole of God’s creation, including all peoples, all creatures and the environment which sustains us all. “Let love be genuine; hate what is evil, hold fast to what is good; love one another with mutual affection; outdo one another in showing honour. Do not lag in zeal, be ardent in spirit, serve the Lord. Rejoice in hope, be patient in suffering, persevere in prayer. Contribute to the needs of the saints; extend hospitality to strangers.